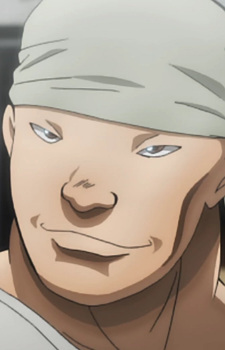 The leader of a mercenary group who fought Baki. He was once a reckless mercenary called Nomura who loved killing. However, after facing the "ultimate fear" when faced with a firing squad during the Ugandan Bush War, he lost his hair and the personality of Gaia manifested from Nomura, as well as gaining supersensory ability. It is said that Gaia is Yuujirou's equal in combat. However, when it comes to jungle warfare, he is considered to be the king and he is often called as "Mr.War" and "War god." As a evidence of his ability, he and his mercenary team was hired by the JGSDF as a instructor for non-conventional warfare, and they defeated an entire company of soldiers including a Type 90 Tank in a training battle with ease. As Nomura he is best described as a weakling who acts as a medic for the team. However, when the situation is right and his adrenaline starts pumping, the Gaia personality will manifest itself to fight. He utterly despises Yuujirou, stating he is nothing but a thrill seeker that fights for pleasure. He fights Baki and honorably loses to him. When he crossed paths with Yuujirou, Gaia told him that Baki is a better warrior than Yuujirou can ever be before the two fight (even though he loses miserably). Gaia makes a surprising appearance in the 'Search of Our Strongest Hero' manga by replacing Jack Hammer during his fight with the Russian convict Sikorsky. He proceeds to defeat Sikorsky with ease, and terrorises Sikorsky into admitting defeat. His three philosophies when fighting are one, take care of your body and give it rest; two, free your body from the control of your mind; and finally, use every part of your surroundings as a weapon. In the current series, he no longer works for the JGSDF, and is seen working as a bodyguard for the new American president.